On Friday, January 9, 2015 I was hired to conduct an inspection on a nicely renovated 52 year old house. It had been remodeled with updated bathrooms, new siding and despite its age, looked very nice and it absolutely was for the most part. Like the Superior Effort article I wrote in December 2014, I was informed that the house had also been recently inspected. The seller told me that the house had been inspected in the summer of 2014 by another potential buyer. That deal, I was told, fell through because of septic issues but the seller had the septic system replaced following that deal’s demise. I was also told by the seller that the, “only other thing” the other inspector found was an issue with the chimney flashing which they had fixed. Just like I said in the December 20 edition of the Superior Effort article, perhaps another inspector would have cruised the rest of the way home on this second inspection but I did not. Following are some examples as to why, in my humble opinion, you should hire Regal Home Inspections, LLC to perform your new home inspection. Here are some of the items that I found during the inspection that the, “other” inspector should have found. 1) The New Jersey law that oversees home inspectors requires that home inspectors test the, “Entrapment Protection Mechanism” for garage doors. This includes the photo-eye beams mounted close to the floor on the garage door tracks and the auto reverse in the event something gets caught under the door as it’s closing. One garage door had the photo-eye but the other did not. Additionally the doors required adjusting on the down-force-tension because they did not reverse when tested. Starting in 1993, garage door openers had to come with these safety features. It should be reported if they aren’t installed or operating in a home inspection report. 2) New Jersey Home Inspection laws follow the Standards of Practice of the American Society of Home Inspectors (ASHI). ASHI is actually mentioned in the NJ Administrative Code that oversees home inspectors and how they should perform their job. The Standard of Practice allows inspectors to inspect a sampling of regular electric outlets but the inspector must inspect all Ground Fault Circuit Interrupt (GFCI) outlets. 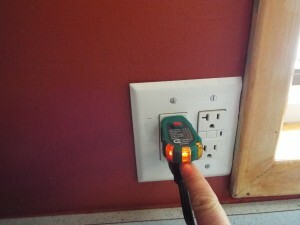 GFCI outlets help protect people by disconnecting the electricity if the GFCI outlet detects that the electricity is going-to-ground in a manner that is abnormal. This might occur if stray voltage and current went through a person because of faulty wiring. That’s why GFCI outlets are required outside, in garages and near all water appliances; sinks, etc. to name a few. GFCI outlets are basics in 2015 construction just like a foundation and roof. GFCI outlets in specific areas are mandatory. So when a house is being inspected for a sale, the inspector HAS TO CHECK EVERY GFCI outlet and every outlet that should be GFCI. Without getting too technical, suffice it to say that one GFCI outlet can protect the others that it serves in a multi-outlet circuit. In this photo, the GFCI outlet on the right (the one with the buttons), operates as it should. Outlet on right is GFCI. Outlet on left is NOT GFCI protected PLUS it has reverse polarity. However, not only is the outlet next to it NOT GFCI, it is wired backward! The polarity is reversed. Again, without getting too technical, this is very dangerous. An outlet that is wired with reversed polarity has the potential to electrocute someone very easily because the “Hot” line is in the wrong place. 3) Another blatant error on the part of the inspector that was here 6 months back is the duct for the bathroom exhaust fan. Inspectors are trained to be aware of bathroom exhaust fans that are not installed with the duct work to the outside. They sometimes vent to inside the attic (see the @regalhomeinspec Inspection find of the week from late December with the vent fan with no ductwork). While they are often very hard to find because the fans and ducts are often under insulation or in hard to reach places, in the house yesterday, it was very easy to see and right in front of you, if you looked and cared to know what you were looking at. 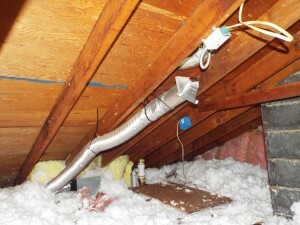 Silver duct from bathroom fan is blowing moist exhaust air into the attic. This can promote mold growth. The bottom line is that I will do the best inspection possible. Combine that with my competitive pricing and I believe I offer the best professional home inspection value in New Jersey. For a house that was “inspected” by another licensed home inspector within the past 6 or 7 months, I found items that should have been found previously. About the author. I am a NJ Licensed Home Inspector. I am the owner and Inspector at Regal Home Inspections, LLC. In addition to being a New Jersey Licensed Home Inspector I am also a NJ-DEP certified Radon Measurement Technician and Regal Home Inspections, LLC has also collected samples for lead paint, allergens and mold. We are affiliated with the best labs that perform the sample evaluation and testing. We can also help facilitate the testing of septic system and numerous aspects of oil tank evaluations. This includes oil tank integrity testing, tank locate services and soil samples. We work to ensure that the house you’re buying is sound or that you know of any issues.